PowerHouse, designed by the Gulf of Maine Research Institute and funded by the U.S. Department of Energy and the Seaver Institute, was begun in 2013 with the goal of designing an online learning environment targeting home energy management. MMSA was one of several subcontractors for the project, with the role of leading teacher professional development, through November 2014. Using the existing network of laptop computers and classroom web access, along with the rapidly growing network of smart electrical meters in Maine households, PowerHouse gave Maine’s 7th- and 8th-grade students and their families access to their home electricity data. Students collected and analyzed this home electricity data as they engaged in authentic investigations to make evidence-based decisions about electrical consumption. 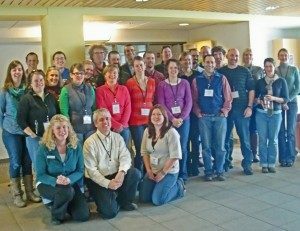 Twenty-six teachers representing 16 schools and 1,650 students across Maine made up the innovative team of educators working to design and develop this student- and family-focused science and mathematics program. This group convened in January 2013 and were introduced to a prototype of the PowerHouse online environment, which included the types of investigations students would engage in and the interactive tools available to students for carrying out data collection and analysis. This carefully selected stellar group of pilot teachers brought a multitude of prior energy/data experiences to the table and made the commitment to complete at least one investigation with students during the spring semester using the PowerHouse prototype. Their experiences informed the design of future iterations of PowerHouse, tested with new groups of teachers and students. PowerHouse enables students to view electricity use graphs, allowing exploration of their home’s hourly, monthly, and yearly consumption. Challenges, at the centerpiece of PowerHouse program, allow students to conduct authentic investigations using evidence-based reasoning to make decisions about home electricity use. Users can readily see the CO2 output of the kilowatt-hours they use and compare their data to similar households. PowerHouse fosters energy management decisions, which both lower energy costs and impact on climate change. GMRI continues to support the PowerHouse project. Sign up on their website. GMRI leads this project. Partners and collaborators on the PowerHouse project include Central Maine Power, Tilson Government Works, Image Works, and MMSA.